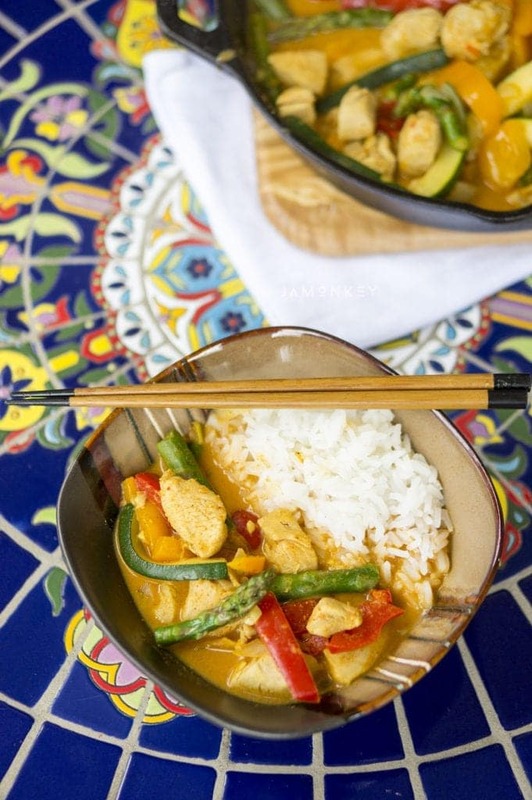 I'm a sucker for a flavorful meal and this Thai Coconut Curry Chicken and Vegetables is bursting with it. 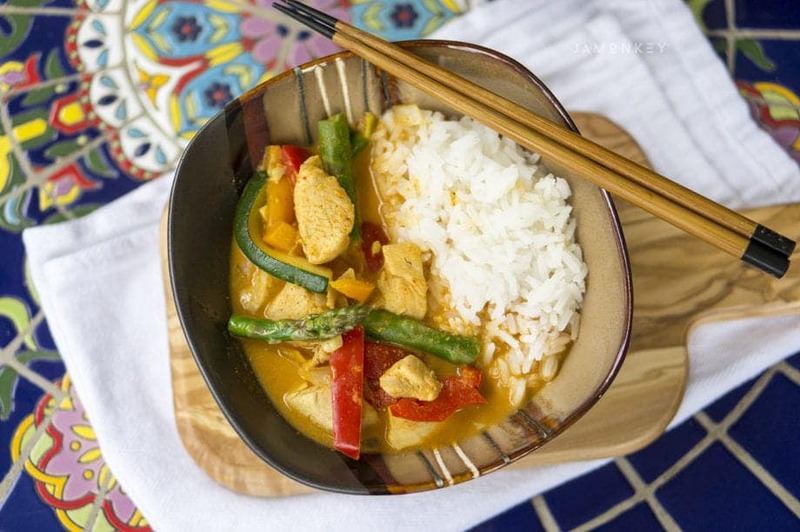 It is one of my husbands favorite meals to make at home and we vary between green curry, lemongrass sriracha, and this one. It is simple enough to make at home and you can use any of your favorite vegetables that are in season that you like. 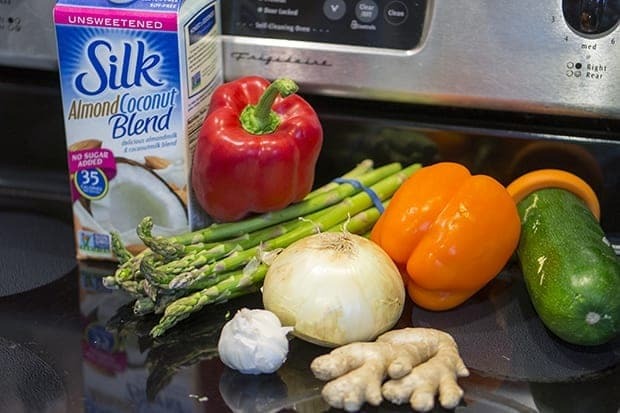 I use Silk Almond Coconut blend (unsweetened) in this recipe because you get the thickness of the almond milk and the taste of the coconut milk. I always buy my Silk unsweetened because I don't like the added sugar and flavors in my recipes. Not to mention it cuts down the calories as well. You can find the unsweetened version of all of Silk's products. This recipe takes a lot of prep so I enlist the help of my husband to help me chop, or you can chop all your vegetables ahead of time. I cut everything thin so that it can easily eat it with a fork. I also like to cook in stages so I make sure I don't burn something. It happens more than you think.I also only have one high edge pan so I used it and then removed what I was cooking to do the rest in it. I start with the rice because it can cook the whole time you are making the curry and be ready by the time everything else is done. After cutting my chicken into cubes I placed it in a bowl with the fish and soy sauce to marinate a little. This allowed me time to heat the pan and coconut oil so that when I transferred the chicken to the pan it started cooking immediately. After the chicken was done cooking I set it aside to work on my vegetables. Same as the chicken I heated the pan with the coconut oil in it and then placed the onions in first. Once they became translucent I added the garlic and ginger for about 10 seconds until it was nice and fragrant. I then added the rest of my vegetables to the pot and continued cooking until they were cooked. Add in your chicken. In a smaller pan, I placed the red curry paste and started heating it. 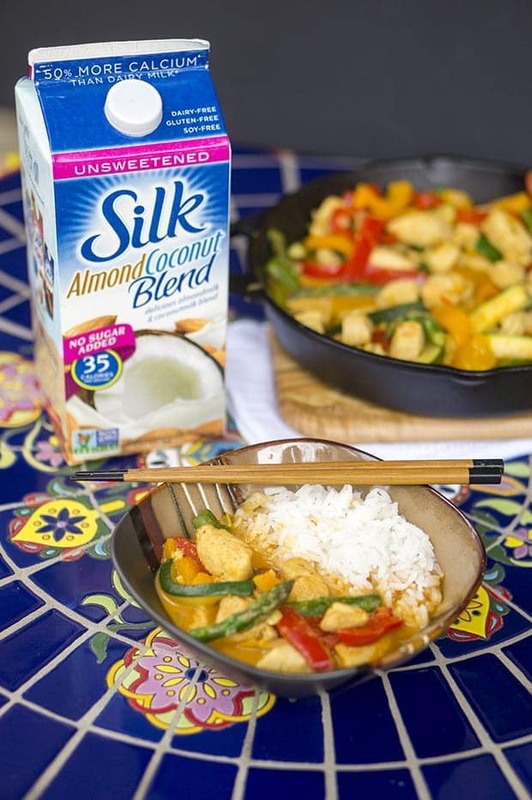 With a whisk, blend the Silk Almond Coconut Milk and the curry powder with the red curry paste. Once it is blended well and warm you can add it to you vegetables and chicken. press your chicken and vegetables into the curry sauce until they are well covered. Cook on medium high heat until the curry starts to boil. Reduce heat to a simmer and cook an additional 10 minutes to allow the chicken and vegetables to absorb some of the curry sauce. Serve over a bed of jasmine rice. Isn't that a beautiful colorful dish? Not to mention dairy and gluten free (make sure to use gluten-free soy sauce). Make jasmine rice according to directions. Marinate chicken in fish and soy sauce while you preheat your pan with 1 tbsp coconut oil. Cook chicken and set aside. In preheated pan with 1 tbsp coconut oil, place onion and cook until translucent. Add garlic and ginger and continue cooking for another 10 seconds until fragrant. In a separate pan heat red curry paste for less than a minute. 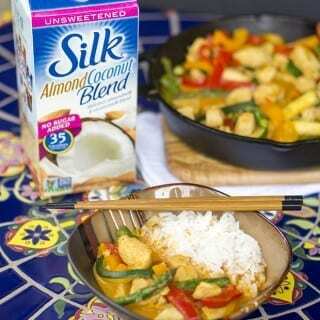 Add Silk Almond Coconut milk and curry powder with a whisk until blended. Heat until warm and then add to vegetables and chicken. Press everything into the curry to thoroughly coat everything. Bring to boil and then reduce to a simmer and continue cooking for another 10 minutes. Serve over a bed of jasmine rice. Please invite me the next time you cook this! Yum! I’m on a bell pepper kick lately, so those are making my mouth water! This particular dish looks really healthy and delicious to eat. I must try it at home. Thanks for sharing it with us.